A Virginia Commonwealth University student’s fundraising campaign to begin production of her all-natural insect repellent for horses has exceeded its $15,000 goal. Brooke Riggs, a senior chemical engineering major in the School of Engineering, held a Kickstarter campaign to start rolling out her Champion’s Natural Fly Spray, which has a proprietary blend of natural essential oils to repel flies, gnats and other insects without the use of DEET, pyrethrins or other synthetic chemicals. By the final day of the monthlong campaign, Riggs has raised $17,421 from 124 backers. Riggs spent two years researching and developing the product, which she says not only avoids the harmful chemicals found in the sprays commonly used to control flies in the equestrian community, it also acts as a natural coat conditioner for the horse. She invented the product while going to school at VCU and working part-time at TheLab, the research and development lab of Huvard Research and Consulting Inc., located in Chesterfield County. The company was founded by Gary S. Huvard, Ph.D., a former VCU faculty member who is also Riggs’ mentor. 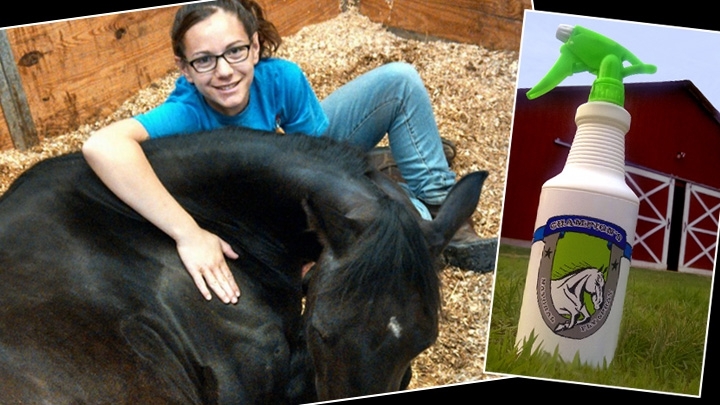 Riggs said her Kickstarter campaign was successful because of the support of the equestrian community. Equestrians, she said, are eager for an all-natural fly spray, which is needed to keep horses — and horseback riders — insect-free without harsh chemicals. Now that her Kickstarter campaign has wrapped up, Riggs said the next step is to apply for a provisional patent and to get registered by the Environmental Protection Agency. Article by Brian McNeill, Virginia Commonwealth University Office of Public Affairs and originally published on VCU News.